SIHANOUKVILLE (Khmer Times) – An award-winning documentary filmmaker from South Africa says he was robbed of camera equipment worth thousands of dollars on an overnight bus to Sihanoukville – and that neither the company nor police will investigate. Marius Van Straaten said he was robbed on a Virak Buntham Express bus from Siem Reap that arrived in the coastal town on July 27. Multiple police officers in Sihanoukville refused to investigate the alleged robbery, file a report or even take his statement, he said. He said that lack of assistance from local police prompted him to bring his complaint to the attention of Sihanoukville’s police chief and write to the Anti-Corruption Unit in Phnom Penh, raising concerns of police negligence and possible complicity. Mr. Van Straaten said he arrived in Sihanoukville on a Virak Buntham sleeper bus at 6 am to discover that a bag containing his camera gear had been emptied and stuffed with blankets belonging to Virak Buntham Express. “The blankets were [used] to make it appear full so that we would only discover the theft once we opened the bag at our hotel,” he said. Mr. Van Straaten was awoken when the overnight bus stopped in Phnom Penh. He noticed that the driver and his assistant were moving luggage around. “It was late, and most people on the bus were still asleep and completely unaware that the staff were moving the luggage,” he told Khmer Times. Staff at the company’s Phnom Penh office declined to discuss the allegations, saying they were unaware of them. They did, however, say luggage is usually shifted in Phnom Penh because some passengers switch to buses to Vietnam and other destinations, or only take the bus to the capital. After the Phnom Penh stop, the bus continued to Sihanoukville, Mr. Van Straaten said. “When we arrived in Sihanoukville, I couldn’t find my second bag and the bus driver strangely went from being helpful and civil to aggressive and impatient,” he recalled. 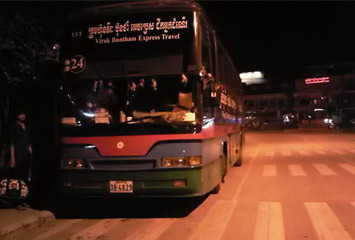 He said that Virak Buntham Express staff who had spoken English to him previously began to pretend that they could not. They also appeared edgy and impatient, he said. “I finally found our second bag at the back of the bus, on the floor, emptied of $6,000 worth of equipment, presumably in Phnom Penh,” Mr. Van Straaten said.